Home > Blog > After COP21: What Needs to Happen for the Paris Agreement to Take Effect? The world rightly celebrated when 195 countries signed onto a new international climate agreement at COP21 in Paris late last year. The Paris Agreement is a critical turning point—a fundamental pivot toward a zero-carbon and climate-resilient world. But some key steps lie ahead to take the momentum from Paris forward and ensure that the Agreement quickly comes into effect and is fully implemented. 1) At COP21, countries agreed to the Paris Agreement. Does that mean the Agreement is now in effect? No, countries still need to take steps so that it takes effect. What occurred on December 12 at COP21 was the “adoption” of the Paris Agreement by the Conference of the Parties (COP) to the UN Framework Convention on Climate Change (UNFCCC). Adoption is the formal act that establishes the form and content of an agreement. 2) What needs to happen now? Broadly speaking, countries must now actually join the Paris Agreement and become Parties to it. To do this, each country must now sign and indicate their consent to be bound by the Agreement. Only after at least 55 Parties to the UNFCCC representing at least 55 percent of total global greenhouse gases sign on and indicate their consent to be bound will the Agreement “enter into force,” meaning it will come into effect and be legally binding. After entry into force, the first meeting of the Parties to the Paris Agreement will be held. This will be an important time to adopt many of the more detailed rules and procedures necessary to make the Agreement effective. 3) What’s the timeline for countries to ratify the Agreement? On April 22, 2016, all Heads of State can sign the Agreement at a high-level signing ceremony at the United Nations in New York. The Agreement will then be open for signature for one year, until April 21, 2017. Given the importance of the Paris Agreement and the political momentum created at COP21, experts expect many countries will attend the high-level signing event. While signing indicates a commitment to refrain from acts that would defeat the object and purpose of the Agreement, a signature alone does not mean that a country becomes a “Party” to the Paris Agreement. As with many other international agreements, joining the Paris Agreement follows a two-step process: countries must sign the Agreement, and then also indicate their consent to join and be bound by it as Parties. 4) How do countries indicate their consent to be bound and become Parties? Most countries will sign the Agreement “subject to ratification, acceptance and approval,” making their signature conditional on obtaining the required domestic approval for joining the Agreement. In some cases, they will also enact any national legislation necessary to implement the Agreement. For example, in Australia, the only requirement is formal notification and introduction of the Agreement in Parliament, whereas in Mexico, the consent of the Senate is also required. In the United States, many international agreements are joined as “executive agreements” based on presidential authority. When a country fulfills its necessary domestic processes, it will come back and deposit an “instrument of ratification, acceptance or approval.” This is a formal document indicating that it has completed all necessary processes and can now join the Agreement. This can be done as soon after signing as a country chooses, and there is no time limit for when countries submit these forms. A country might deposit its instrument of ratification, acceptance or approval on the same day it signs, or submit it separately much later. 5) Can Parties still join the Paris Agreement after April 22, 2017 if they didn’t sign it before then? Yes. After the one-year signing period, the Agreement will be open for what is called “accession.” Accession is simply the term for when a country becomes a Party to an international agreement that other countries have already signed. Depositing an instrument of accession after April 22, 2017 will have the same legal effect as if that country had signed and deposited an instrument of ratification, acceptance or approval – but it is distinct from those. 6) So when will the Paris Agreement actually enter into force? The Paris Agreement will be in full legal force and effect when at least 55 Parties to the UNFCCC that account for at least 55 percent of the total global greenhouse gas emissions have deposited their instruments of ratification, acceptance, approval or accession. At this point in time, it is not possible to accurately predict when this will occur, as it depends on how quickly individual countries are able to complete their domestic approval processes. Once the Agreement enters into force, the first meeting of the Parties to the Agreement will occur in conjunction with the next COP. The figure below illustrates three possible combinations of countries for meeting the 55 percent threshold. 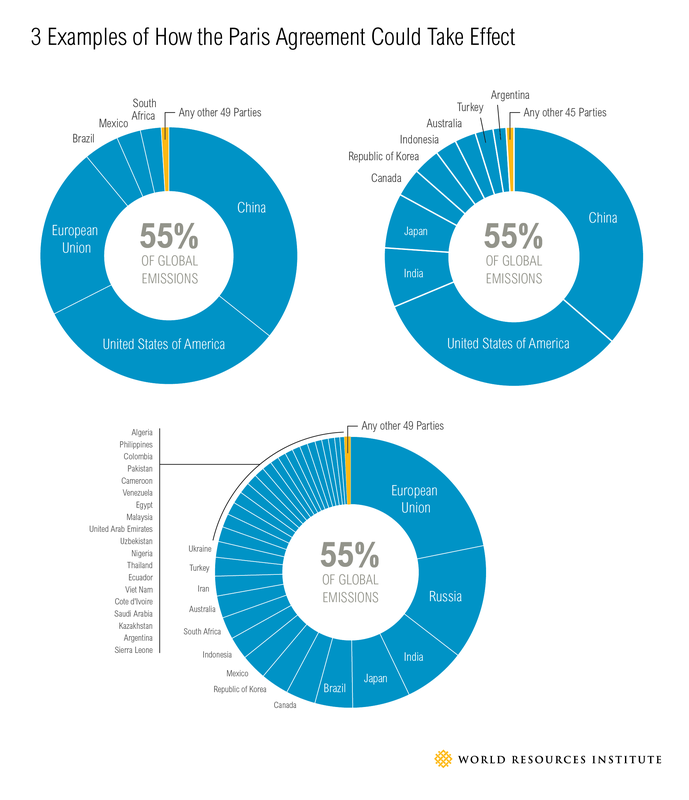 While a range of country combinations exist, based on the most recent emissions data communicated by countries to the UNFCCC, our analysis shows that the 55 percent threshold cannot be achieved without the acceptance of at least one of the top four emitting Parties, China, the United States, the European Union, or Russia. The timing for when each of these countries might join the Agreement depends on each of their unique domestic legal systems.